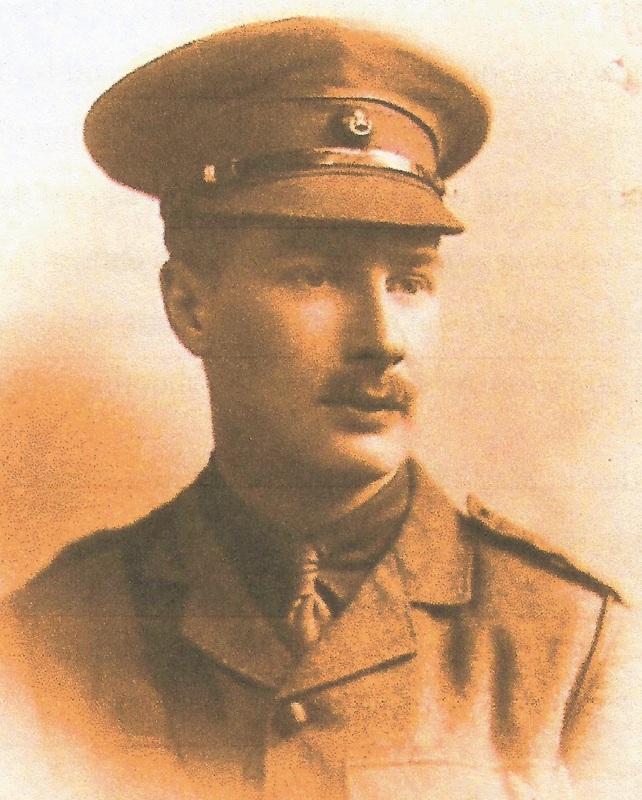 Frederic Sydney Trench was born on 9th December 1894 in Woodlawn, County Galway to the Third Baron Ashtown, Frederick Oliver Trench and Lady Violet Grace Trench (nee Cosby). He was their eldest son and expected to inherit the estate at Woodlawn. Census Records 1901 show that at the age of 6 he was a scholar, and could read and write English only. He was the eldest brother to Grace, Robert, Arthur (and Dudley would be born later). They lived in the Big House, alongside many servants and would have had quite a privileged upbringing. His brother, Robert (Bob Ashtown in 1951) wrote ‘ … we daily used to roam And hunt for treasure on our own. Seldom was so much pleasure won By youngsters day by day!’ (My Happy Childhood Days 1902 – 1912). It was in 1908, at the age of 12 that Frederic went to England to begin his formal education at Eton College in R.S. Kindersley’s House. From there he progressed to Magdalen College, Oxford where he studied Classics. Rowing was a passion and he achieved great acclaim on the river. He joined the Officer and Training Corps in Oxford, and went to train to be an officer at Sandhurst with a number of his Oxford friends. His education had him appointed as a seargant and he joined the King’s Royal Rifle Corps. There was a call for two million soldiers, and his status ensured his recruitment as an Officer. He would always declare himself Irish on his papers. On 8th December 1914 the 3rd Battallion KRRC entered France. The officer’s role was to maintain morale and ensure all were clothed, watered and fed. He wrote home to his mother for comforts such as cigarettes and chocolate which he undoubtedly shared amongst the troops. The officer would lead his men out of the trenches. It was a requirement that the officer be several paces ahead of his men and encourage their advancement. A junior officer’s life expectancy was only three months. Frederick returned to France and got promoted to Lieutenant. He returned to Ireland twice in the following fourteen months, his mother writing ‘she was pleased to have him home for a bit’, yet he was keen to return to the front. In November 1916 bloody battles ensued on the German line with little success. The Royal Fusiliers failed to capture positions and a new attack was commanded from the 5th Batallion. It was a foggy morning. Many soldiers lost direction. Frederic, in command of 250 soldiers, overstepped their objective in confusion. They were surrounded on three sides by German infantry. They dug in and returned fire. They soon came under fire from their own artillery. Reports show Frederic was wounded in the chest and arm by shell. He died of his wounds two days later on 16th November 1916. Frederic was buried in Mailly Wood Commonwealth Cemetery, Mailly-Maillet France. A wooden cross originally marked his grave. When the wooden cross was replaced by a gravestone it was brought back to Woodlawn. 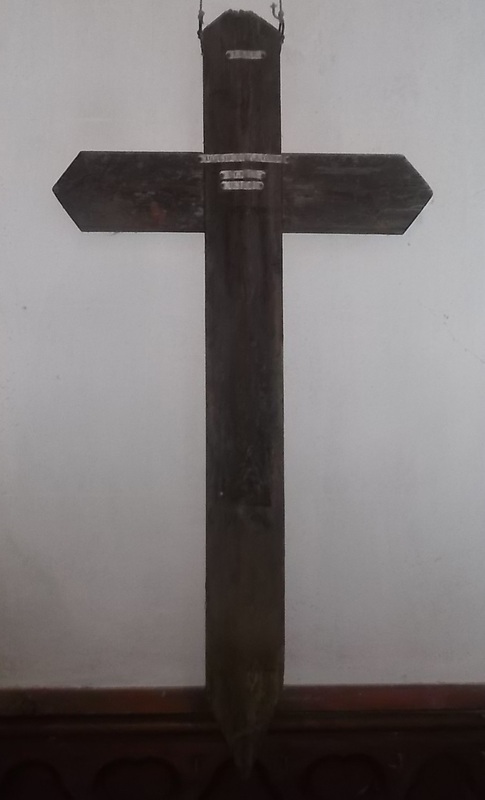 The wooden cross now hangs in the Church. 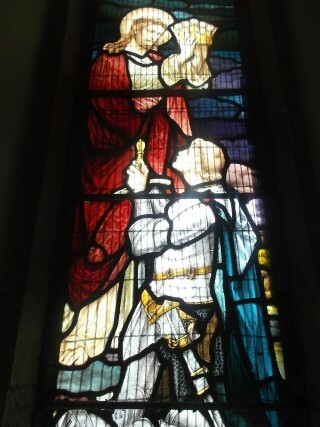 A stain glass window was also erected at the church by his parents in his memory. It was produced by Heaton, Butler & Bayne, London. Frederic is one of many from the area who fought in World War One and the Battle of the Somme. 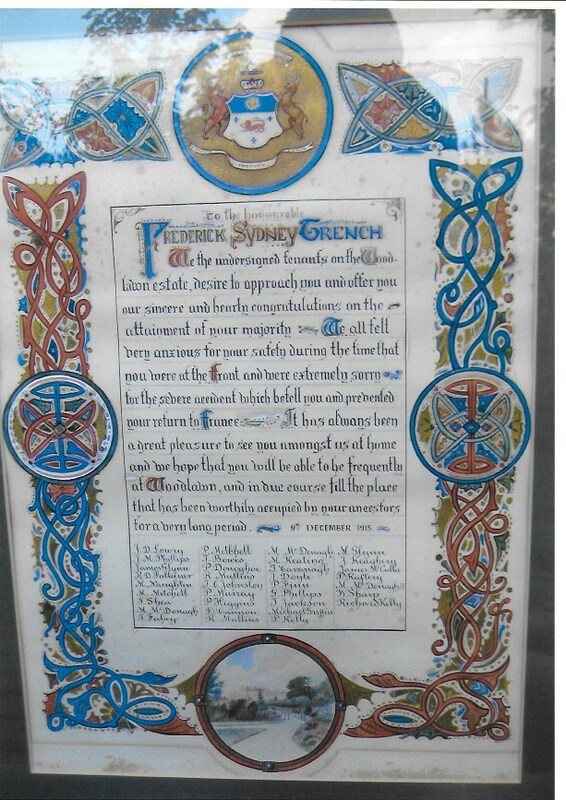 A Roll of Honour dedicated to worshipers in Woodlawn hangs inside the door of Woodlawn Church. Information for this article came from a paper given to Roderick Trench entitled ‘ Lieutenant The Rt. Hon. Frederick Sydney Trench 1894 – 1916. Writer unknown at present. This page was added on 14/11/2016.